THE Aspley school and parish community celebrated the golden anniversary of St Dympna’s school on August 11. 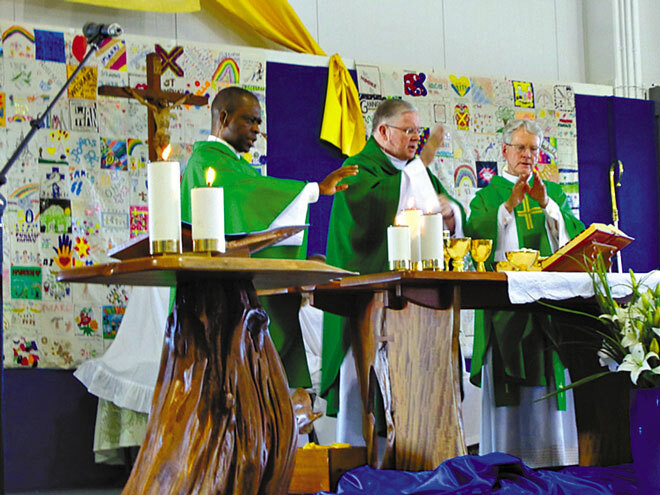 The fiftieth anniversary celebrations began joyfully with a Jubilee Mass concelebrated by Brisbane Archbishop Mark Coleridge, parish priest Fr Gabriel Kalu and former parish priest Fr Peter Luton. The Sisters of St Joseph at the invitation of the then parish priest Fr Tom Guy founded the school. Sister Bernadette Barlow was the founding principal. Several Josephite sisters attended the celebrations. A spokesman said after Mass there was a morning tea for invited guests including former teachers, principals of the school and parishioners. Principal Janet Smith welcomed Brisbane Catholic Educations executive director Pam Betts, who congratulated the school on the anniversary. 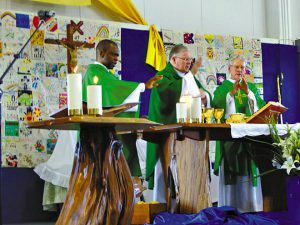 Day to remember: Aspley parish priest Fr Gabriel Kalu, Brisbane Archbishop Mark Coleridge and former parish priest Fr Peter Luton concelebrating the Jubilee Mass. “After morning tea guests gathered to recollect on the changes that had taken place in the last 50 years and reminisce over the many memories,” he said. “During the afternoon parents and children enjoyed the Jubilee Fair and were entertained by the school’s Senior String Ensemble, the school band, and all the fun of the fair. “At noon a crowd watched the retrieval of the time capsule which was buried 25 years ago in the grounds. “A commemorative book celebrating the 50 years of the school’s history was compiled by the Jubilee Committee.